Anglian Home Improvements return to Hampton Court after 3 years with an impressive new concept in garden design. Working on behalf of Anglian Home Improvements David Domoney plans is to create a ‘Naked Garden’, literally meaning our plants will be getting their pots off and baring all. Yes, it’s time to reveal all the interest that is growing underneath the soil. 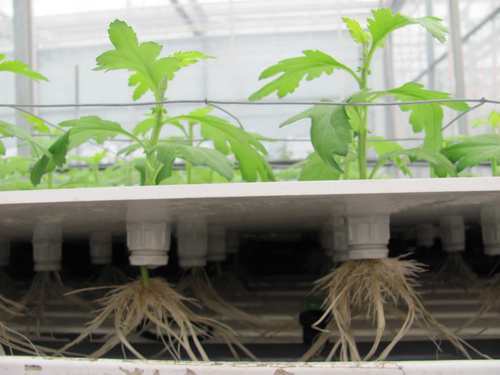 We never see the roots of plants growing as they are hidden underground, so we are planning new innovative solutions for growing plants whilst exposing their roots. Soil is the main structure that holds the plant into the ground, aiding its intake of nutrients, water and oxygen, helping the creation of growth in roots, foliage, stems and blooms. To remove all the soil and keep the plants alive is not easy and in some cases; it has never been done before. Whoever, there are particular plant categories and plant cultures that we think we can adapt to grow without soil. First on the list are bulbs. The great thing about this family of plants is that they store all the energy they need to produce a flower inside their own structure. Bulbs are one of the easiest plants to grow; it is like a little self contained plant battery. All those layers and layers of leaf or stem combined together, create the ultimate flower, all packaged by nature in a tight little bulb. To see this in practice try cutting an onion in half and see all of the layers inside, these layers are in fact modified leaves, during the summertime when it’s very hot all the nutrients from the foliage goes underground, and is stored as energy. It then bursts into growth the following spring and dies down again during the hot summers. Bulbs can effectively grow in water alone, using the energy that is stored within it structure. We are planning to grow plants such as narcissus, paperwhites and hyacinths in glass. Amaryllis and tulips can also grow effectively in glass, providing the bulb does not make contact with the water. We have been talking to some of the leading growers in the UK and Holland, selecting some of the most spectacular bulbs that we are going to use in the garden. 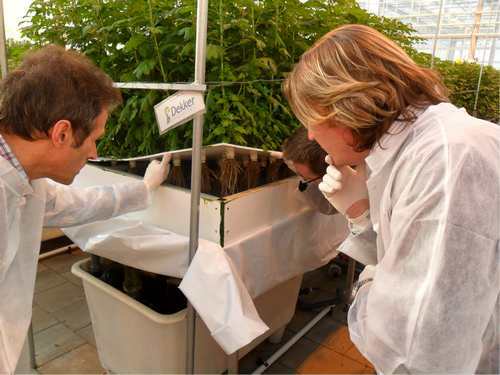 Second on the list are vegetables, with some new, innovative propagation techniques, scientists and growers are growing plants in water (aqua/hydroponics) enabling the precise control of nutrients and creating a disease free environment. We are going to adopt this technology to grow lettuce, cabbages, cauliflowers and tomatoes for the ‘Naked garden’ in July. Aquatic plants are also a very interesting proposition for this project. We are planning to take these out of the water and aim to plant them in glass containers; there are a few plants that lend themselves perfectly to this use, such as water hyacinths, zantedeschias. We’ve also been looking at more exotic plants and have been chasing around the tropical world of plants similar to epiphytes. Epiphytes are plants which grow above the ground surface, using other plants or objects for support, using their roots to grab hold of trees etc, and collect water underneath the canopy of the rain forests either from the air or the dampness on the surface of their host. We have found some fantastic orchids that will do this job perfectly and we are looking at adapting those for our garden. After much hard work and research we are finally starting to overcome the challenges surrounding growing plants in water, having pulled together a group of scientists, growers and aquatic specialists our aim is to bin as many plant pots as possible. Anglian Home Improvements specalises in conservatories, double glazed windows and doors. For information on our conservatories visit the Anglian website here.